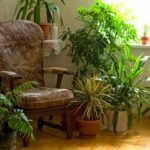 Hibiscus and citrus trees are popular for these kinds of rooms, but really any tropical plant would do well in a Florida Room. Since yours is partial sun, a bird of paradise is possible as are begonias, elephant ears and caladium. Any tropical plant that can take partial sun will do, but these are some of the most popular for partial sun due to their color and beauty.